las2peer is a distributed, highly reliable and secure platform for creating community information systems and community services. It is the successor of the LAS (Lightweight Application Server). The main goal of the framework is to provide a fast and flexible way to create services which may communicate with each other and their users through standard protocols. The used and stored information is handled in a trustworthy way and within full control of the communities. First of all, las2peer is an environment for bachelor and master students to implement, deploy, test and evaluate Web services. Students can run their own las2peer node on their computer and connect conveniently to the already existing seed network. As a consequence, the utilization of existing services is much easier and implementation efforts for students are minimized. Moreover, las2peer comes with a built-in monitoring and visualization mechanism for evaluating Web services in a consistent manner. The MobSOS components are installed in the seed network and ready to be used by all students. In summary, by using las2peer Bachelor and Master students have less work and gain advantages. las2peer is a research environment covering all aspects of advanced community information systems. In the moment, we want to give only two examples, but there are more. With las2peer it is possible to run multi-agent simulations and to understand the consequences of Web service utilization from a very practical point of view. This is continuing very successful results published e.g. in IEEE Internet Computing. 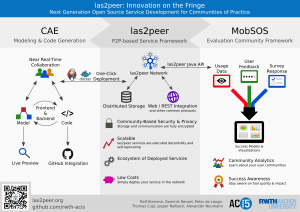 las2peer supports real communities by selective composition of Web services for real-world needs. How communities search for IT support on the Web is largely not understood. las2peer is applied in research projects. One example is the Learning Layers project where las2peer works together with the Tethys cloud computing environment to scale up informal learning solutions in the Layers Box approach. las2peer also serves as an asset and prior art for future project proposals.